How Green Are Your Flowers? Last year, over 5 billion flowers were imported to the U.S., many from Colombia. For the past couple of weeks leading up to Valentine's, workers at Milonga Flowers, a medium-sized flower company outside Bogotá, have been waking up at 5 a.m. Workers arrive at the flower plantations at 6 a.m. and go back home at 6 p.m. (if they are lucky), when it is already dark. "Valentine's day is the highest season of the year," said German Lacouture, owner of Milonga. "At that time, we need to hire more workers and increase the production to fulfill the demand". When you buy a Valentine's rose bouquet online or at the corner deli, there is an 80 percent chance that it comes from Colombia or Ecuador. We tend to be conscious of our organic vegetables and drinking fair trade coffee. Yet, are you asking yourself if the roses you are buying were produced in a sustainable, ecological way and under fair conditions? And most importantly, how can you tell? One way to find out if your flowers are "ethical" is to see if the bouquet carries the label of certification programs like Fair Trade USA, the Rainforest Alliance or the Florverde Sustainable Flowers brand. These programs demand that flower farms that carry their logo meet minimum labor requirements such as paying workers for overtime and giving them safe conditions in which to carry out their task. Flowers without such labels do not necessarily come from farms where workers are exploited. But advocates of certification programs argue that their labels can provide customers some guarantees of fair labor conditions, because auditors for these labels are constantly monitoring farms. "The big problem in the industry was that women [who cut and trim the flowers] were allowed to go into greenhouses immediately after they were sprayed with pesticides," said Paul Rice, the CEO and President of the Fair Trade USA certification program. "The result was very high levels of cancer, particularly cervical cancer in the industry and also lots of birth defects," Rice said. According to Rice, farms which want their flowers to be certified by his brand must set aside 10 percent of earnings for a development fund which gives workers the opportunity to implement community projects. One farm in Ecuador recently used this fund to buy washing machines for female employees who were previously spending most of their Sundays washing their families' clothes by a local river. In Colombia, the local flower industry has come up with a scheme that is similar to the Fair Trade program, called Florverde Sustainable Flowers. This label does not oblige its member companies to set aside funds for community projects. But it does demand companies to restrict the use of pesticides that have been deemed too dangerous for the health of their workers. Farms that want their flowers to carry the Florverde green flower logo must also make sure that no one is working with pesticides for long amounts of time. "Here, fumigators rotate every four months and they take blood tests before and after [each] rotation," said Hernando Sanabria, a supervisor at Milonga Farms a company which joined the Florverde program three years ago. 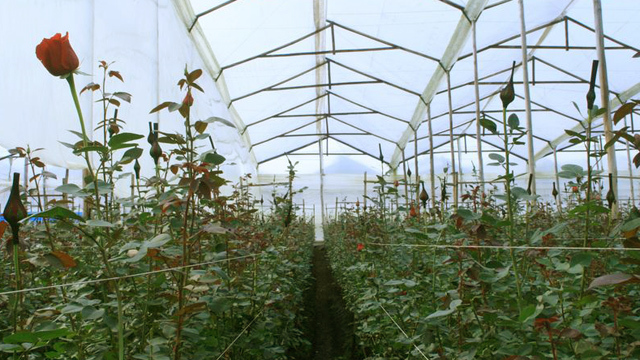 Milonga Flowers has 37 acres of flower plantations located an hour outside Bogotá, and has been producing roses for 22 years. With 200 employees and an average daily output of 30,000 flowers, it seems to be a good model of sustainability. "I've been working for Milonga Flowers for more than 20 years and I care for this farm as if it was mine," added Sanabria, who was formerly a fumigator. "Here I met my wife and I have been promoted to three different positions." Despite its benefits, certification programs only cover a small share of global flower production. The Fair Trade Program, for example, is growing quickly, and it certified 10.5 million flower stems in 2012. But in that same year, the United States imported more than 5 billion flowers, according to the U.S. Customs and Border Protection. 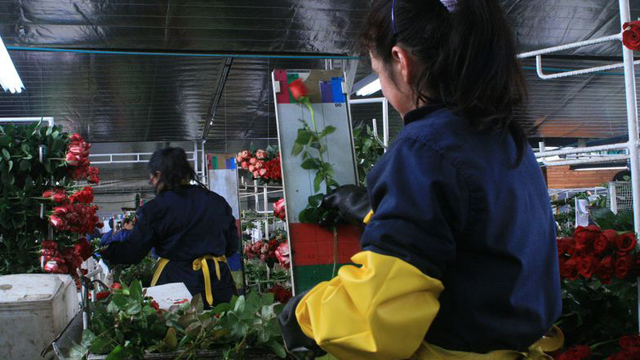 In Colombia, critics of Florverde say that while it has helped to improve some worker safety issues, it has not acted against bosses who are breaking unions up. "The Florverde standard does not give workers the right to form the organization of their choice, nor does it prohibit companies from engaging in anti-union activities," reads a letter which was signed by Colombia's National Union of Flower Workers and 14 other groups in 2008, shortly after Florverde received international status. "Florverde promotes 'information and participation mechanisms' for workers but does not include unions in the list of examples of such mechanisms," the letter reads. There is also another problem faced by Colombian flower workers, which has so far fallen out of the scope of certification programs. Many employers in the country are trying to avoid direct hires in order to reduce costs, since in Colombia labor contracts are seen as expensive because they oblige the employer to pay for many non-salary benefits. "Companies outsource to do core jobs when it's only legal to do so for secondary jobs like transport," said Laura Rangel founder of the NGO Cactus which specializes on flower worker's rights. Rangel says that it is difficult to calculate how many workers in Colombia are currently on temporary contracts that provide few social benefits as companies keep this information to themselves, and getting them to release it entails complex legal procedures. So how helpful is that label on your bouquet of flowers? Stephen Coats from the Labor Education in the Americas project says that certification programs so far have a mixed record. He says that while they have helped improve worker safety conditions and helped to decrease issues like child labor, it remains to be seen what they will do to promote workers' right to unionize. "I think [these schemes] are positive in that retailers are recognizing that consumers are gravely concerned about conditions under which their products are made and are to some degree taking some responsibility for that," Coats said. "But there has been much less effect in terms of ensuring workers' right to freedom of association."